See more objects with the tag borders, symmetry, mermaids, birds, clothing, trimming, cornucopias. See more objects with the color saddlebrown tan grey darkolivegreen dimgrey or see all the colors for this object. This is a Band. It is dated 18th–19th century and we acquired it in 1953. 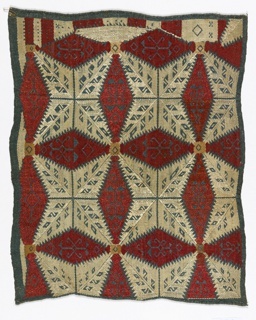 Its medium is silk embroidery on linen foundation and its technique is embroidered in long-armed cross stitches on plain weave foundation. It is a part of the Textiles department. This object was featured in our Object of the Day series in a post titled A Greek Embroidered Band.